Lovers (or haters) of the new Palm Pre have torn the handset apart on the internet and found a few interesting facts out about the new phone on the block. iFixit has posted a detailed breakdown of the Palm Pre's innards, as well as documenting the difficulty it had in obtaining one of the devices. A quarter of the phone's weight is made up by the keyboard and its sliding mechanism, which the site claims still makes the device ligher than the iPhone, although some internet commenters have put it (shockingly) two grams heavier. There's a 600MHz ARM processor under the hood powering the webOS along nicely, as well as a 430MHz image signal processor so the whole device is pretty well stocked for grunt. Word is that the 1150 mAh battery is a little bit harder on the juice than the iPhone, despite both being the same weight and power, but given the Pre can run background applications this isn't so much of a problem according to iFixit. The Pre also employs a similar 3D antenna system to the iPhone to give it good signal, which early user reports have confirmed is pretty good on the Sprint network. iFixit reported a certain amount of flimsiness in the construction of the innards, which will make the phone harder to service, as well as the camera being underpowered despite being better than the iPhone's. But the overall impression is a good one, commenting that the insides bear a lot of resemblance to the way that Apple puts its devices together in a much smaller package. 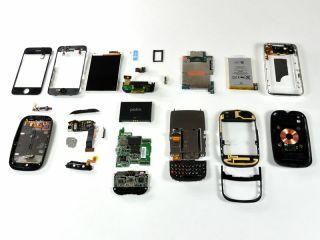 Check out the detailed teardown over at iFixit.